Consumers want short-term digital loans, but financial institutions are losing out because their current methodologies are not profitable. BSG Financial Group, a provider of revenue-enhancement programs and compliance solutions for financial institutions nationwide, announced today that it will present an educational webinar entitled "The Emerging Digital Lending Opportunity for Community Financial Institutions” on Tuesday, November 14 at 2 p.m. EST. The free webinar, hosted by CPA firm Porter Keadle Moore (PKM), will outline how financial institutions can streamline lending processes, increase loan revenue and recapture loans lost to non-bank lenders using digital lending technology. Financial executives can register for the webinar at the following link: http://www.pkm.com/event/the-emerging-digital-lending-opportunity-for-community-financial-institutions/#register. PKM is hosting this webinar to educate community and regional banks about the rapidly growing digital lending market and its tremendous earnings and savings potential. 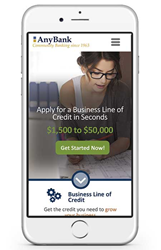 “Digital lending technology provides a profitable way for community banks to deliver consumer loans under $30,000 and small business loans under $100,000 in only minutes on computers and mobile devices,” said Jeffrey Harper, president of BSG Financial Group. “Consumers want short-term digital loans, as evidenced by the impressive growth of non-bank and Fintech alternatives, but financial institutions are losing out because their current methodologies are not profitable,” he said. Currently, community financial institutions hold fewer than 10% of small business loans under $100,000 and 5% of consumer loans under $50,000. The webinar addresses this area of underperformance and offers solutions to expanding loan sales, improving speed of service and efficiency, and enhancing customer satisfaction with digital lending technology. “With digital lending technology, there is an alternative that can keep financial institutions competitive in protecting their customer base from alternative lenders, while also garnering new loans and deposits,” said Harper.